The Cabo Branco Lighthouse is located on a cliff on the Cabo Branco beach in João Pessoa, capital of the Brazilian state of Paraíba. The construction is located about 800 meters north of the Ponta do Seixas, the easternmost point of continental Brazil. The lighthouse, which has a unique triangular shape in the country, is one of the most important and visited postcards of the capital of Paraíba. Formed by a triangular concrete tower, three pointed wing-shaped projections 3.5 meters from the ground, the headlight is painted white with a horizontal black band just above the wings. For decades, long before the city of Joao Pessoa entered the tourist route, this lighthouse was already known to mark "the most eastern point of the Americas"; however, such title belongs to Ponta do Seixas, which is located nearby. 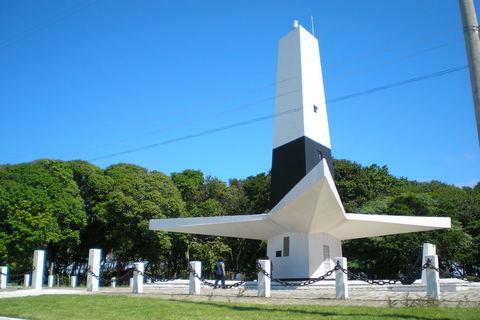 The monument project is by Pedro Abraão Dieb, a retired professor from the Department of Architecture and Urbanism of the Federal University of Paraíba (UFPB), who died on November 26, 2007, in João Pessoa. It was inaugurated on April 21, 1972, under the government of Emílio Medici, in full military dictatorship. Its designers intended to represent a sisal plant when designing the lighthouse. The sisal represented one of the most enduring and profitable economic cycles in the state of Paraíba.